Escape to the Beach Retreat and to one of the most beautiful beaches around. Awesome, unobstructed views of the Gulf of Mexico from this professionally decorated luxury condo. NO steps, NO elevator waits, it's out the door of this first floor unit and over to the beach via Beach Retreat's private access. After enjoying the beach, relax at the 3000 square foot heated pool. The pool area includes a whirlpool, sundeck and picnic area with tropical landscape. Return to the condo and enjoy the beautiful sunset from the lounge chairs on our oversized patio, accessible through the 8 ft. sliding glass doors in both the living room and master bedroom, all facing the beautiful Gulf of Mexico. Cook dinner in our new newly done kitchen- new granite counter tops and new stainless steel appliances- or just enjoy drinks on the bar stools with great views of the Gulf. After dinner relax while viewing your favorite movie on a 55' LED Flat Screen TV with surround sound. Condo has a total of 4 Flat Screen TVs . Vacation with all the comforts and amenities of home. 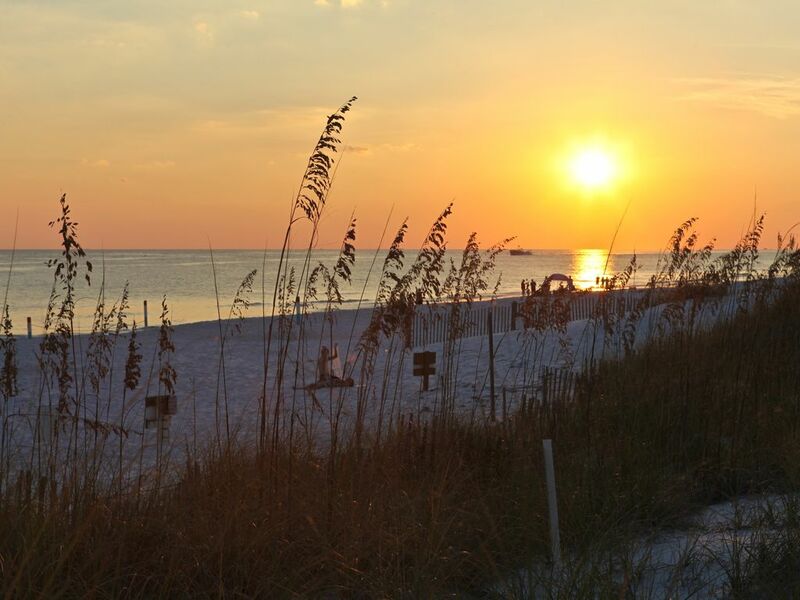 The Beach Retreat is a short distance from the Silver Sands Outlet Mall, Big Kahauna Water Park and the Destin Marina. We are within walking distance to Pompano Joe's, Captain Dave's and The Crab Trap restaurants- all great dining establishments right on the beach. Don't wait make your reservation now, before it's too late!! The Beaches of South Walton offer some of the best beaches in the world. Miles of silky white sand and crystal clear water- It doesn't get any better. Nothing beats a day at the beach, deep sea fishing in the gulf, golfing on any of the great courses nearby- an afternoon drive down 30A through Grayton Beach, Watercolor and Seaside- an evening out at the Destin Commons or Baytowne Wharf- enjoying any of the many great restaurants nearby or shopping at the outlet mall if you so desire. This place is paradise. Large 250 Sqq. Ft. patio that over flows on to lawn area with great landscaping and awesome views of the Gulf. I will stay there again next year! Great place to stay. Clean and very accommodating. We will definitely be back. Great location. Beach access is great. Had a wonderful time. Wouldn’t hesitate to stay there again! This is our 2nd year staying at this condo. Excellent communication with owner, beautiful condo, perfect location. Hope to go back next year! All excellent! Location, cleanliness, well kept - all great! Conveniently located on the the Emerald Coast. A great complex with all the following located nearby: golfing, fishing, boating, shopping, water park, boating marina, sunset cruises, many great restaurants. Daily beach service (umbrella & 2 lounge chairs) included with all rentals from March -October. Free WiFi included with all rentals.